Is Inflation Running Hot or Cold? One popular measure of the price level is the consumer price index (CPI), which measures the average change over time in the prices paid by urban consumers for a market basket of goods and services. This index can be broken down into smaller component indexes, each representing a different subset of goods and services. So changes in the aggregate price level can be traced back to changes in the price levels of the underlying components. 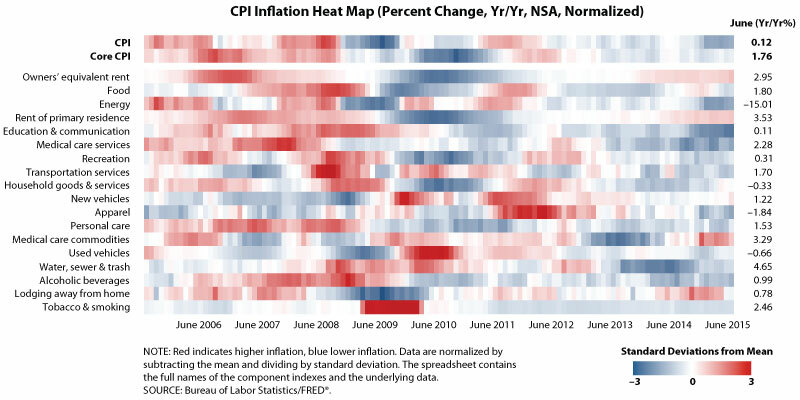 As described in a recent Economic Synopses essay, we have developed a “heat map” that visually represents CPI data in FRED: specifically, the relative inflation levels of various CPI components over the past 10 years. The heat map shown here lists the components in order according to their weight in the overall index as of July 17, 2015. How this heat map was created: We used the FRED Add-In for Microsoft Excel (view instructions for installing the Add-In here) to download the FRED data: year-over-year percent change in each CPI component index over the past 10 years. We normalized each value by subtracting the series mean and dividing by its standard deviation calculated over the past 10 years to take into account differences in long-term trends and volatility across series. Each colored box in the heat map corresponds to the normalized inflation value for a given CPI component for a particular month. Blue represents an inflation value below the long-term trend of the index, and red represents an inflation value above the long-term trend. The darker the color, the greater the difference between that particular inflation value and the long-run average for the component index in terms of standard deviations. Because we’re comparing series against their long-run averages, it’s possible for a “blue” series to have a higher inflation rate than a “red” series. For example, for June 2015, owners’ equivalent rent is red, with an inflation value of 2.95 percent; water, sewer, and trash is blue, and yet has a higher inflation value of 4.65 percent. The reason is that the June 2015 owners’ equivalent rent inflation is above its 10-year average of 2.16 percent; and the June 2015 water, sewer, and trash inflation is below its 10-year average of 5.11 percent. Suggested by Joseph T. McGillicuddy and Lowell R. Ricketts.